**TEMPORARILY OUT OF STOCK** Frida Botanicals Magnesium Cream works against chronic pain and aids muscle relaxation by replenishing local extracellular ionic magnesium stores. The Magnesium Chloride used is from the ancient European Zechstein deposit, the purest source in the world. 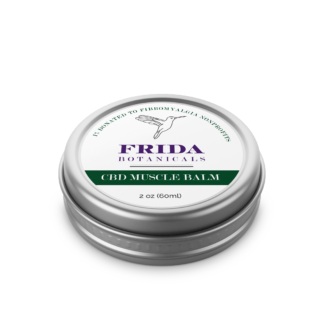 Another wonderful product from Frida Botanicals! I already purchased and fell in love with their CBD muscle balm, (amazing) so I figured I’d try this too. I apply it to my feet and lower legs before bedtime, and I really do notice a difference! I feel more relaxed and sleepy than I did before adding this into my routine. It’s a wonderfully helpful step to add in for such a low price. Let me add that they’re not joking when they say to gently squeeze the bottle before using. If you don’t, you might get something more like an oil than a cream. If you take a second to massage the tube first, you’re golden. Another great find! But now that I do own one, I’m very particular about what I’m willing to haul around in this portable piece of real estate. Items must be worthy, provide real value for the space they occupy, and most important, effectively barter for pain with my body. 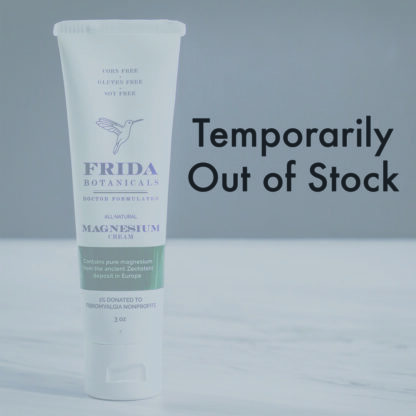 Frida Botanicals Magnesium Cream is just such an item. I am surprised anew each time I apply it how well it smooths under the warmth of my hands. There is nothing quite like it. This stuff reliably comes through every time, so much so that I use it every night- like a ritual. It has become part of my sleep hygiene. I don’t leave home without it. It’s a rare thing in this world to know I have a source for botanicals I can trust 100%. I’ll even go so far to say that I’m grateful for my box. 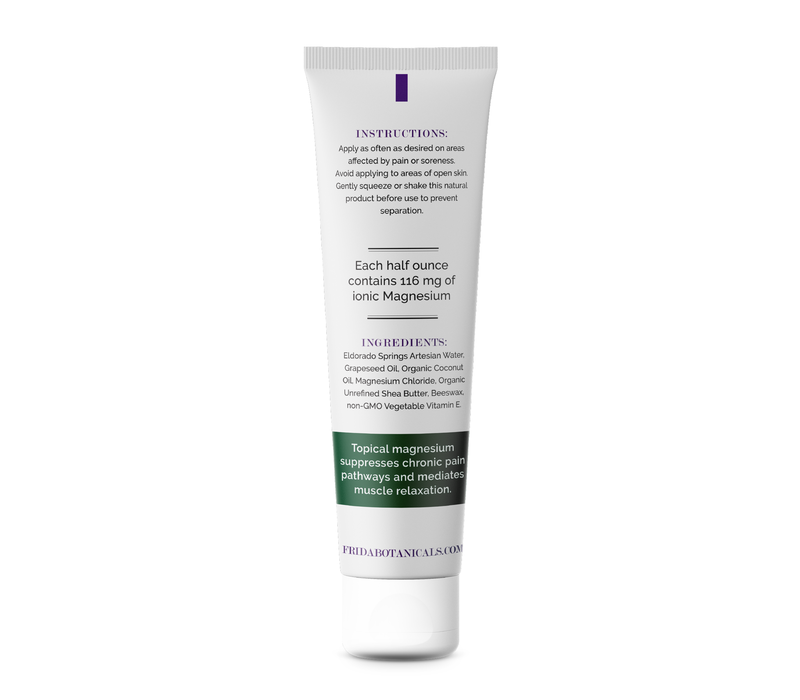 I have been using another magnesium cream wherever and whenever I hurt: back, knees, feet, hands. If this sounds familiar, I’ve found a better product! Frida Botanicals Magnesium Cream is more concentrated (I use less and get more relief.) It is more smoothly applied and more absorbent than the other. It smells good. IT DOESN’T BURN MY BACK when it is applied, while the other did. It lasts me many hours and I have a tube in my purse and one on my nightstand. Would not go anywhere without it and it is fairly priced. HIghly recommend this. This is great for sore muscles! My holy grail combo in life is this layered with their CBD muscle balm. These two products together work like nothing else I’ve ever tried for sore, achy, or stiff muscles. I don’t have Fibromyalgia, but I still can’t live without these. My wife who does have fibro turned me onto Frida Botanicals, and I’m so glad! For maybe 8 years I’ve taken magnesium supplements orally to help relax my muscles after working with a naturopath who determined I was deficient. The undesirable side effect is occasional loosened bowels. Since using this product I am able to reduce oral supplementation. Love this stuff. I put it on my knees at night so I can sleep the night through. So glad there is this cream. I don’t know if this stuff works yet or not. I’ve been using it on painful areas, but haven’t noticed any relief. I was very impressed with the speed of delivery, so thank you for that. I’ll not give up and still hope I get some relief from the Magnesium cream.